Two seasons ago, the Kentwood Kangaroos went back to the Superdome and established themselves as one of the best programs in 1A winning their 8th state championship. The main offensive player, on that team, was dynamic QB Shyheim Carter, who would go on to sign with Alabama. Carter would go down to be one of the greatest players to ever come out of the historic football program. The question, for Head Coach Jonathan Foster and the Kangaroos, was who was going to replace such a dynamic playmaker like Carter. They looked no further and placed another dynamic offensive threat at quarterback, and his name is Jaleel Hampton. Hampton played wide receiver on that state championship team and made the easy transition this season at quarterback. Even though the Kangaroos did not repeat as state champions this season, the team still made the semi finals. A major reason for the team’s success last season was not only Hampton’s playmaking ability, but how quickly he was able to make the transition from playing wide receiver to playing quarterback. 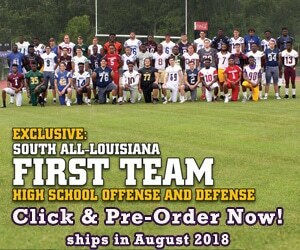 Before the season started, Louisiana Football Magazine Owner/Editor/T.V. Host Lee Brecheen had a lot of praise for Jaleel Hampton and still believes that he was one of the most underrated players in the state this season. All of his talents attracted our attention as he was named to our 1st All-Louisiana team before the season started. After the season ended, the talented athlete from Kentwood High School has signed to play football at Pearl River Community College. The Wildcats definitely have themselves an exciting player who can be plugged in at basically any skill position. The Pearl River Community College signee talked about his senior season, transitioning from wide receiver to quarterback, the advice that he received from Shyheim Carter, winning a state championship, and so much more in today’s recruit spotlight! LAFM: What is your max bench press and 40 yard time? LAFM: What is the college that you have decided to continue your football career? I have signed with Pearl River Community College. LAFM: What is it about Pearl River Community College that has attracted you to play football there? The coaching staff and the great environment were the reasons why I have signed with Pearl River. LAFM: You are one of the best athletes to come out of Kentwood. You were also a star receiver in your junior year as well as a really good quarterback down the stretch last season. How has the transition been for you this season as far as the positions go? The transition was really easy for me. I played quarterback in my sophomore year so I picked up where I left off. LAFM: Shyheim Carter was a great football player for the Kangaroos. What advice did he give you that helped you as a quarterback this season? He told me to “keep my head up” and give it my all no matter what the outcome of the game is. Just give your all! LAFM: What position do you want to play at the next level and why? My plans, for the next level, is to not only play slot receiver, but anywhere else that my team needs me to play. I need to improve on my speed. Tyron Johnson (former Warren Easton and LSU wide receiver that has transferred to Oklahoma State) is somebody that I really look up to. I also look up to Jarvis Landry (former Lutcher and LSU wide receiver who is currently with the Miami Dolphins). LAFM: Before the season started, you were named to our 1st All-Louisiana team. What does it mean for you to be recognized as one of the best at your position? It means a lot to be selected for 1st All-Louisiana team. When football season is over, I participate in other sports such as baseball and track. LAFM: You were part of the state championship team two years ago. What is it like bringing another state championship to Kentwood? It is the best feeling that a high school athlete can have. LAFM: This season, the team didn’t go back to back, but had another fantastic year making it to the semifinals. What are your thoughts on your senior season as a whole? I thought that this was the best senior year that I could ask for. We didn’t win a championship, but we put together a broken puzzle and we grew along the way. We started the season at 0-3 and won six straight. Then, we went all the way to the semifinals. It was a great senior year. LAFM: What is your message for next year’s Kentwood football team? My message is to stay strong and never give up on your teammates. Believe in each other and enjoy playing high school football. Demetrius Hookfin played college football at LSU in 2000. First off, I want to thank God because if it was not for him, I wouldn’t be in this position. I also want to thank my teammates, my coaching staff, my aunt, and most importantly, my mom! LAFM: What separates yourself from all the other athletes in the state? What separates me is my mindset and my vision for the game!